Free Usenet Radio Download from FilesPack.com! Plays mp3 files directly from Usenet newsgroups like a radio. Install, enter your account information and it starts playing mp3 files automatically. It's that simple. Stop, pause and play using familiar media player controls on the main window. Working for you beneath the simple user interface is a powerful newsreader engine that collects files from multiple connections on multiple servers. Advanced users can edit or create new group lists that combine search results from multiple newsgroups and servers. All the popular encoding schemes are handled automatically. 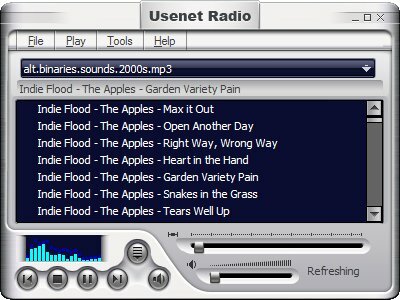 You can free download Usenet Radio 1.00 now.